WEBSTUFF Israel Review 2019: Is WEBSTUFF Israel a Good Hosting? WEBSTUFF Israel is a hosting provider based in Shlomi, Israel. The company was founded in 2000. It specializes in the delivery of a variety of web hosting solutions for individuals, businesses, and big corporations in Israel and beyond. WEBSTUFF Israel is a web hosting provider established in 2000. The vendor has its offices in Shlomi, in the Northern District of Israel. It focuses on providing various web hosting solutions including: shared hosting, cloud servers, dedicated servers, VPS, and colocation services. The firm also offers domain name registration services, SSL certificates, and SEO and internet marketing solutions. Its website is available in both English and Hebrew. WEBSTUFF Israel servers are built for excellent performance. Their advanced architecture and the innovative components included allow its customers to run fully functional websites that hardly ever record significant downtime. The vendor’s servers are connected to high speed network channels with static IP. They operate on both Linux and Windows OS platforms. This vendor’s shared hosting solution comes in four packages, with the only difference from one package to another being the disk space. Webhost Basic comes with 100MB disk space, Webhost Starter 300MB, Webhost Advanced 500MB, and Webhost Business 1GB. That said, the hosting company allows its customers to customize some of these packages to suit their particular website needs. The WEBSTUFF Israel VPS starter package comes with 512MB RAM and 5GB disk space. Its premium VPS package comes with 2GB RAM and 50GB disk space. All VPS packages include 2MBps bandwidth. This vendor offers professional, complex, and automated full backups for its customers. Your data is backed up regularly giving you the peace of mind you need in the event of a disaster. Users can request access to these backups to restore their websites, databases, and emails. The daily backup data is stored for 30 days. WEBSTUFF Israel offers Let’s Encrypt SSL certificates as additional services which customers can purchase. Available SSL certificate packages include: SSL Standard, SSL WildCard, SSL 5 Sites UCC, and SSL 10 Sites UCC. WEBSTUFF Israel hosting prices are extremely expensive, especially if you factor in the fact that the vendor includes very few features, many of which have notable restrictions. The prices are displayed in this vendor’s website in Israeli shekel. The vendor offers flexible monthly billing cycles. WEBSTUFF Israel commits to refunding its new customers in full if, for whatever reason, they are dissatisfied with its hosting solutions within the first 30 days of hosting. This hosting company offers free cPanel migration, free DNS hosting and management, and an uptime network guarantee of 99.95%. To get in touch with WEBSTUFF Israel there are three options: telephone, email, and ticketing system. There is no live chat support. According to the vendor, its support team is available round the clock. However, my attempts to get in touch with them were unfruitful. I sent a query about its WordPress hosting solutions and server locations but never got a response. WEBSTUFF Israel has yet to add a knowledge base on its website. WEBSTUFF Israel’s combination of enterprise-grade SSD storage and modern infrastructure have made it a preferred hosting company for a considerable number of businesses in Israel. The vendor’s unresponsive support coupled with the fact that it does not have a knowledge base on its website makes its web hosting solutions unfavorable to novice webmasters. 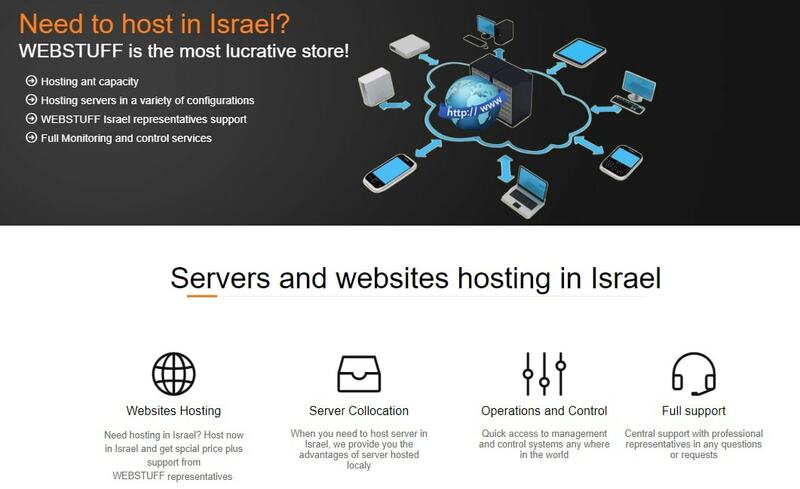 Wondering how WEBSTUFF Israel stacks up against other Web Hosting companies? Enter any other Web Hosting company and we will give you a side-by-side comparison.